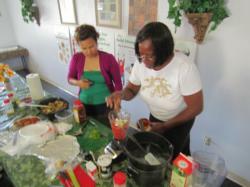 EFNEP is a federally-funded program that offers nutrition education to limited-resource families and children. In Fresno County, California EFNEP is administered by the University of California Cooperative Extension. In 2011, 614 families graduated from the Adult EFNEP program to become better able to manage food budgets, healthy choices, preparation of new foods and recipes, and food safety. The same year, over 7,500 youth received nutrition education focused on healthy eating in fun and exciting ways appropriate for their age level and correlated to the California Department of Education (CDE) Content.